Armstrong’s Point may be terra incognita to many residents of Winnipeg and Manitoba. A large bend in the Assiniboine River creates this relatively isolated residential district which was developed as a suburban haven for well-to-do families in the late nineteenth and early twentieth centuries. The land was granted by the Hudson’s Bay Company to Joseph Hill, who came to Red River in 1849 at the head of a group of pensioners. Five years later he returned to England and left his batman, James Armstrong, in charge of his property. Armstrong died in 1874. When in the early 1880s Hill heard that land values were escalating in the Canadian West, he returned to Winnipeg, reestablished his title to his property, and sold it to a syndicate headed by J. McDonald and E. Rothwell. The first home was built on what is now Eastgate in about 1882. Between that year and 1920 most of the large, stately homes that give the district its distinctive atmosphere were built. This guide will hopefully enable you to imaginatively stroll up and down the streets of this lovely part of Winnipeg. We can enter Armstrong’s Point at Cornish and Westgate. The gates we see, like the ones at Middlegate and Eastgate, were erected in 1910 at the request of the residents of the district. The Library and surrounding park land that one sees at the head of Westgate were once the site of a City of Winnipeg Water Works installation opened in 1882, and later of a swimming bath. The Cornish Library was constructed in 1915. #25 Westgate, just ahead on our left was built in 1911 for McRae Blair and his bride, Muriel Wood, who had both grown up on the Point, at 86 Westgate, the Wood’s home, and at 137 Westgate, owned by the W. W. Blair family. #40 Westgate, ahead and on our right, was built in 1882 by David Young, a merchant in partnership with Higgins and Jackson. It was occupied at one time by W. F. Luxton, founder of the Free Press, and was bought in 1895 by Lendrum McMeans, who later became an MLA and a Senator. The House is now the French Consolate. #54 Westgate, just two houses up, was built for Rev. Charles Gordon, the minister of St. Stephen’s Presbyterian Church and well known author. Using the pen name Ralph Connor, he wrote popular novels such as The Man From Glengarry and Sky Pilot. 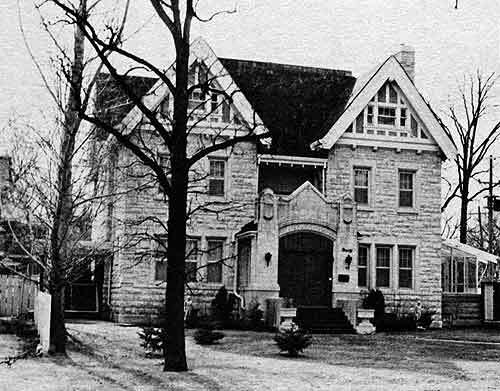 The house is now owned by the University Women’s Club and in 1948 was named a National Historic Site. 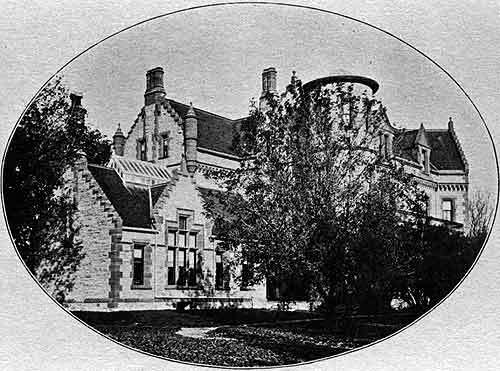 #65 Westgate appears in the Winnipeg Directory in 1912, owned by J. L. Campbell. In 1933, it was the home of J. L. Cork, and later, the home of Mrs. M. McQueen, daughter of C. S. Riley, who spent much of her youth growing up on the Point. #86 Westgate was constructed in the years from 1890 to 1900 for Captain Rockley Kaye. It was a copy of an English country house. Soon after completion it was sold to George Wood, owner of George D. Wood Hardware Company. He named the house “Helenlea” after his wife and daughter. It became a girls’ school in 1951 and now, de-gabled, is the Westgate Mennonite Collegiate. #97, on our left just as we come to Blanchard Avenue, was built for Thomas L. Waldon in 1915 and was later owned by his daughter and her husband, Mr. and Mrs. Douglas Bulgin. Mr. Bulgin was Manager of Dominion Securities. #112, kitty-corner from #97, was built in 1906 by William Harvey, trust company executive. It was designed by J. H. G. Russell. It was owned in the 1950s by Rupert Whitehead, well known for his accomplishments as a figure skater with the Winnipeg Ice Club. It was completely renovated in the 1960s by Ralph Hedlin. #119 Westgate was owned at one time by Sidney T. Smith of Smith and Murphy, Grain Merchants. #131 Westgate was built in 1912 by David Horn, Col. Chambre’s brother-in-law. #134 Westgate, just across from #131J. B. Monk, Manager of the Bank of Ottawa, built this home in 1898. It was the Japanese Consulate until 1976. The gates forming the entrance to #146 on the West side mark the entrances and the lot lines for the former “Ravenscourt” Boys School. A. G. B. Bannatyne, the prominent early Winnipeg merchant, built a large home here on Armstrong’s Point in 1883-4. It originally cost $38,000, had 30 rooms, and was constructed of red sandstone imported from Duluth. It was meant to resemble Rothesay Castle in Scotland where his parents had been married. J. Stewart Tupper, son of Sir Charles Tupper, Father of Confederation, bought it in 1900, and gave it the name “Ravenscourt” at that time. It was sold to Capt. Norman Young for the school in 1929. (Capt. Young was married to Grace Moodie, a sister of Maryon Pearson.) In 1935, the boys’ school moved out to Wildwood and the “Castle” was sold to the Sacred Heart Sisters for a girls’ school. It was demolished in 1950, by which time it was considered a white elephant. #186, at the corner of Westgate and Middlegate, was built in 1920 for R. T. Riley. It was designed by A. A. Shroughton. It was owned in the 1950s by C. S. Riley, R. T.’s son. It is presently owned by Mr. and Mrs. Philip Ashdown. As you turn into Middlegate you will be increasingly aware of the family connections which seem to abound on the Point. #145 was the home of W. J. Tupper, Lieutenant-Governor of Manitoba from 1934 to 1940. #135 was built in 1902 for Ross Sutherland, barrister and realtor. It was he who was instrumental in petitioning City Council to have the gates built. When this was done the streets were given their current names. In more recent times the house was owned by Conrad Riley Jr., a grandson of C. S. Riley. #125 was the home of Dr. Daniel McIntyre, Superintendent of Winnipeg Schools from 1885 to 1928. More recently, it was owned by Norman Gooch, whose name has long been synonymous with bicycles in this city. #123 is believed to have been built in 1891 for F. W. Stobart, wholesale dry goods merchant. #99 was the home of James Ryan Jr., built for him in 1910. #93, at the corner of Middlegate and BlanchardJames Ryan Sr., of Ryan Bros. Butcher and Packers Supplies, built this house about the same time as #99 was constructed. His brother George lived at #57 Middlegate. #94, across the street, was built in 1904 for C. H. Becket. The architect was J. H. G. Russell. #43, well ahead and to our right, was owned by Theodore Hunt, the City Solicitor. #33, right next door, was built in 1909 for Col. Geddes who was killed in World War I. From 1915 to 1936 it was owned by Alexander Calder, owner of the C.P.R. travel shop on Main Street, the first travel agency in the city. Mr. Calder was a taxidermist, inventor and creative business man who shipped Lake Winnipeg whitefish to American markets. At the time of his death, he was the oldest living member of the World’s Rotary Club. #6Henry Linnell, architect, designed this home which was constructed at a cost of $24,000 for John T. Speirs, President of Speirs Parnell Baking Company, now a part of Weston’s. #2 was built at 61 Furby Street for A. H. Egerton, organist at All Saints’ Church. It was moved to its present site in 1928 for D. C. Valentine and in 1959 was the headquarters for the Anglican Church Women’s Auxiliary. More recently this has been the home of Bob Wilson. We’ll now turn right and go over to Eastgate. #5, right on the corner, was built in 1906 by Thomas Ryan, of Ryan’s Boots and Shoes. He was the mayor of Winnipeg while still in his thirties. #45, well ahead, was built in 1930 for Col. J. B. Mitchell, originally of the Northwest Mounted Police. #69, two lots up, was built in 1896 by J. R. Waghorn, the publisher of Waghorn’s Pocket Guide, who was also secretary of the Birdcage Tennis Club (in Armstrong’s Point) and co-founder of the St. Charles Country Club. He called his home Maple Grove and it became a social centre. The dining room seated fifty people in comfort. In 1905 the touring Shakespearean Company, the Ben Greet Players, performed “A Midsummer Night’s Dream” on the grassy knoll in this yard, visible to the right of the front entrance. Dame Sybil Thorndyke was a cast member, on her first tour. The second owner, Dan Bain, was a noted sportsman. Team Captain of the Winnipeg Victorias hockey team that twice won the Stanley Cup, he also placed second in the 1930 Canadian Figure Skating Championships in the waltz contest at the age of 56. His books and papers have recently been donated to the University of Winnipeg. #89, just over by Blanchard Avenue, was built for George Crowe, a Winnipeg alderman in 1911. The J. S. Richardson family owned it from 1945 to 1956. The home has ten fireplaces, nine bathrooms, a ballroom in the basement and a vault under the front entrance hall. It is now owned by the Oblate Fathers. #90, across the street, was built in 1909 by R. T. Riley who lived here until he built 186 Westgate in 1920. The house passed then to C. S. Riley, his son. The walls are 18 inches thick. One mantel has scenes from the Lord’s Prayer. #147, a fair distance ahead and across the street, was built in 1882 for Arthur F. Eden, land commissioner for the Manitoba and Northern Railway and later a partner of Stobart Wholesale Merchants. Some people are of the opinion that this house was originally the home of James Armstrong, though others believe that Armstrong resided on the point only as a squatter. The front door faces the River as the original drive circled to that side of the house. The Bird Cage Tennis Club occupied seven acres here between East Gate and Middle Gate. In 1891, the house was purchased by William Fisher of Happyland Amusement Park. Mr. Fisher called this house Elmsley. The fireplace in the living room is faced with blue Minton tiles telling the story of the Knights of the Round Table and the sword Excalibur. The house was owned until recently by the Dr. Bruce Chown family. 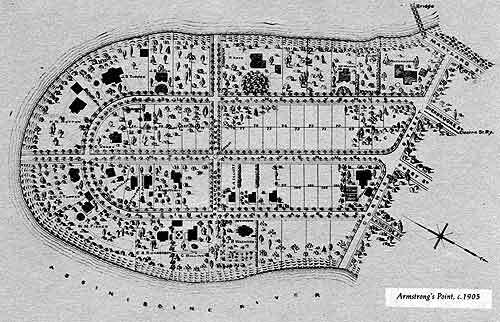 Fisher divided his property into three lots and sold them. 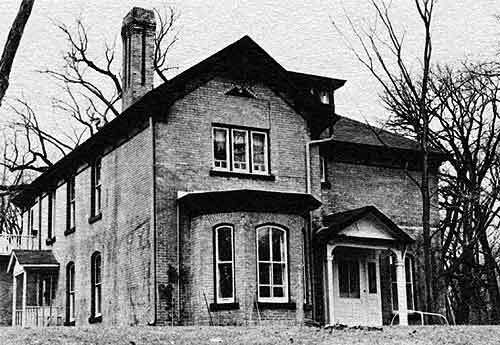 The southern portion, the red brick house, became the Tupper property. W. J. Tupper lived there until he became Lieutenant Governor. This brings us to the end of the walking tour. Armstrong’s Point was a special place, a walled-off place, where families grew up, where the children frequently married “the boy next door” and then moved down the street. The Woods, the Blairs, the Rileys, the Crowes, the Tuppers, the Ryans, the Chambres all had relatives as neighbours. So many of the early residents of this protected point helped to shape our city’s direction and development. We have been able to focus on only a few of these houses with an interesting past. There are many more. We hope you have been able to capture some of the special flavour which is still evident here, and that you will return again to enjoy the history of James Armstrong’s Point. This tour was developed by members of the Junior League of Winnipeg. Additional information was gained through an Art Gallery House Tour in the fall of 1976, most of which was provided by the owners of several of the homes. Reference was made to A. J. Lunty and K. C. Hurley, “Armstrong’s Point: A Historical Survey,” 1969, a manuscript in the Provincial Archives, and to L. Gibbons, Stories Houses Tell. Thanks are extended to Mr. Justice R. D. Guy and R. R. Rostecki for their invaluable assistance, and to Mrs. Muriel Blair for reminiscing with us. 1. Personal communication from David Crawley, 2 February 2010.